Court is now in session at the Dr. Kirk Lewis Career and Technical High School. On Wednesday, Feb. 11, the school held its inaugural Teen Court jury trials, the first of its kind in the Pasadena area. Offered at only 52 schools in Texas, Teen Court provides students involved in the school’s law enforcement program with experience acting as jurors, attorneys and judges in a legal environment, handling real-life cases involving their peers. Students undergo a rigorous selection process to be considered for the program. A committee reviews the students’ grades, disciplinary records and interviews them before making a selection. 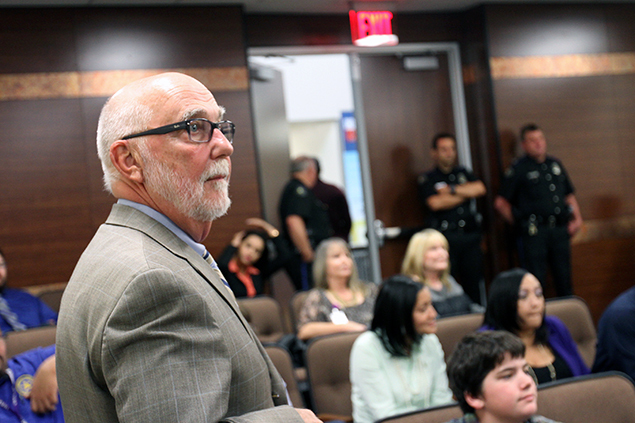 The district has joined forces with Pasadena and Houston municipal courts for this unique experience in which students handle a range of cases for teens who have received citations for minor offenses. Teen court works with Judges Lester Rorick and Jose Cantu to prosecute or defend offenders. Students are responsible for determining the sentences of the defendants. Defendants can be sentenced to serve jury duty on one or several cases and/or eight to 40 hours of community service. The law enforcement and Teen Court programs are designed to promote an interest in the criminal justice profession while simultaneously helping juvenile defendants receive the help they need to avoid and future offenses. Students receive college-level coursework and are tasked with studying the Texas Rules of Evidence and the state’s penal code. In addition, students receive extensive training through their participation in mock trials, tactical practice sessions with simulated ammunition, crime scene investigations and field trips to the Harris County Jail and local municipal courts.